Rebecca (Beccy) and Karl got married at St Georges church in Worcester, before having their wedding reception at Worcester Guildhall. As if those two locations weren't enough, we also hired Worcester Cathedral for some photos in the grounds there too! A lot of planning had gone into the wedding, to ensure that with all the location changes, everyone would be in the right place at the right time. The bride and groom left the church earlier than the guests, and arrived at the Cathedral soon after. The wedding guests however went straight to Worcester Guildhall to enjoy the drinks reception. We finished the formal group photos ahead of time, leaving us with more time than originally planned to take some couples photos along the river and in the grounds of Worcester Cathedral. 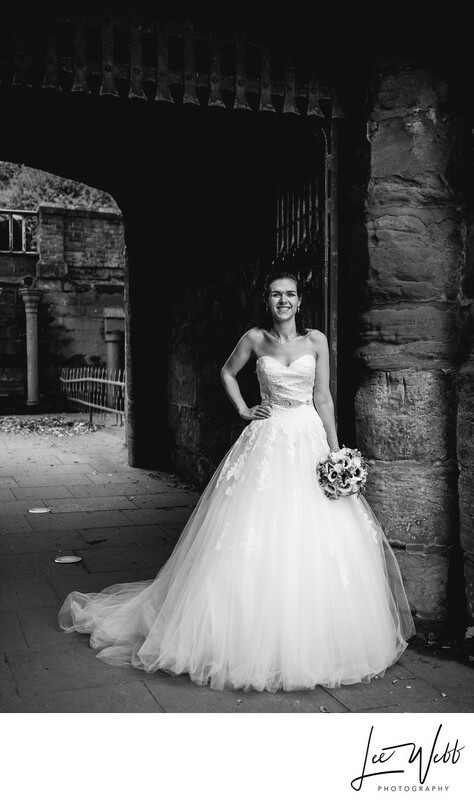 I chose the location for this photo carefully - I wanted to get an image of Beccy in her wedding dress so that we could show off both her figure and the dress itself. A small gateway in the old city wall proved to be the ideal location. The roof to the gateway cut the light out of the passageway itself giving the ideal dark background. Moving Beccy forward into the light provided a huge deal of contrast between Beccy, her dress and the background. The pose was chosen to show Beccy's amazing figure, the dress found it's own shape naturally owing to the type of fabric.